For some people, owning an antique is an investment. For others it is much more. You may be seeking that elusive piece to complete a set, a unique gift for a special person, or you simply collect for the joy of owning something rare and precious. Whatever the need, our range of carefully selected porcelain and pottery items are sure to delight. At Cathcart's Antiques we understand the pleasure that owning an antique brings. 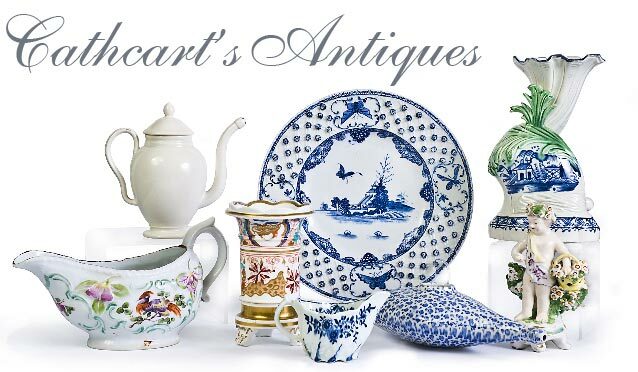 We hold a wide range of antique porcelain, pottery and ceramics, and we can ship to you anywhere in the world. Please explore our on-line gallery at your leisure. Should you discover that special piece, you will have the opportunity to purchase. Please select an option on the right. New Category just added ! - Apothecary, Pharmacy & Chemist Antiques. See our antiques books for purchase.